Neural progenitors induced from primate ES cells. (A) Time course of neural progenitor marker expression in monkey ES cells cultured on PA6 cells. (B) Detached ES cell colonies formed spheres similar to those of neural progenitor cells. 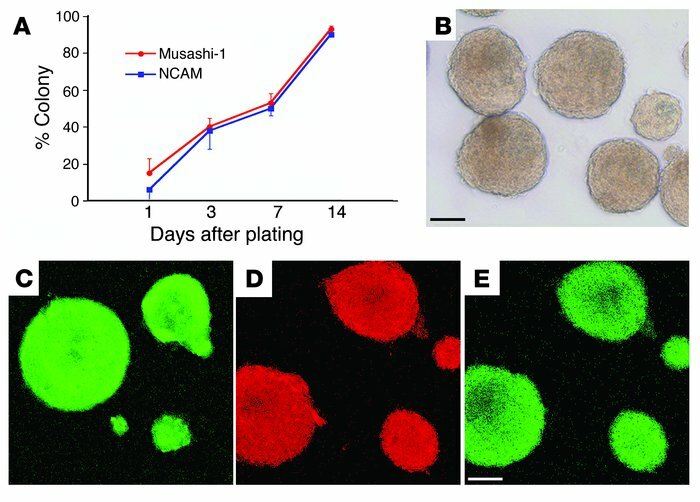 (C–E) Spheres were immunoreactive for NCAM (C, green), Musashi-1 (D, red), and Nestin (E, green). Scale bar: 100 μm.